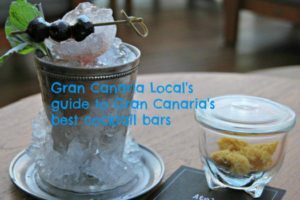 0.1 Looking for top tips on where to eat and drink on Gran Canaria? We’ll share our favourite bars and restaurants with you. Continuing with Atelier Cocktail Bar in the south of the island. 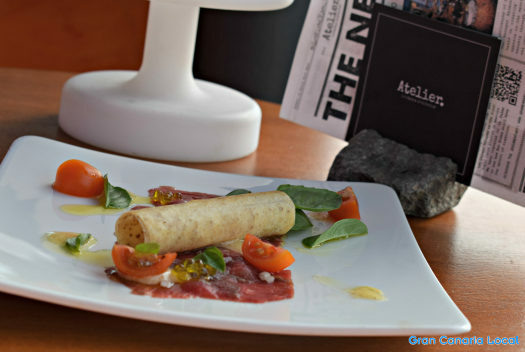 Looking for top tips on where to eat and drink on Gran Canaria? We’ll share our favourite bars and restaurants with you. Continuing with Atelier Cocktail Bar in the south of the island. 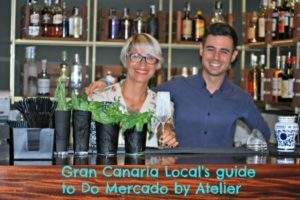 We’ll start, as Gran Canaria Local tradition dictates, by describing how you get to Atelier Cocktail Bar and offer an overview of their philosophy. Then we’ll move on to outlining their drinks list. Concluding with a look at the Atelier menu. 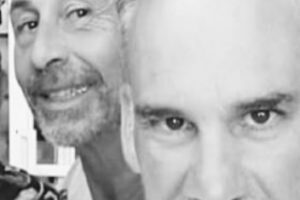 Atelier’s a fashion statement of the increasingly stylish Playa del Inglés. It’s on the 8th floor of the adults-only Bohemia Suites & Spa managed by Fernando Calvo, one of only two Design Hotels on Gran Canaria and winner of Best Service in the Europe and Mediterranean hotel category at 2017’s Condé Nast Johansens annual awards for excellence. Adjoining the acclaimed 360º restaurant, this is a rooftop bar which wouldn’t look out of place in the world’s leading cities such as London or New York. If you want to get your holiday off to a memorable start, Google Maps estimate the typical journey from the island’s airport to Atelier Cocktail Bar to take 26 minutes. The quickest Global bus routes from LPA are the 66 and 90 which will add 13 and 18 minutes to your travelling time. It’s a short walk from the Yumbo Centrum stop along Avenida Estados Unidos before you reach the external lift which will take you up to Atelier, although you can also enter via the hotel itself. This cocktail bar is owned by Rembert Euling, the man who came up with the idea of transforming the rundown Apolo into the award-winning Bohemia Suites, and run by Raimondo Palomba, Gran Canaria’s major mixologist. 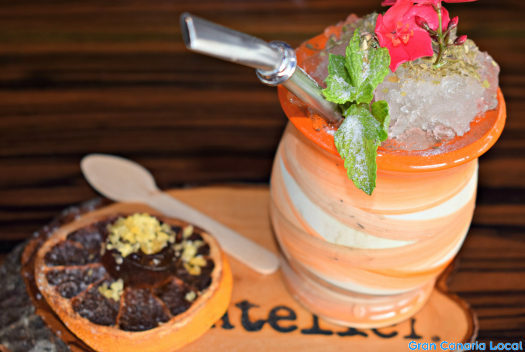 It’s the parent establishment of DO Mercado by Atelier. Inspired to fill a vacuum after relocating to the island from metropolitan Madrid, Palomba wanted to show Gran Canaria locals that there’s more to the world of cocktails than a cubata; the local name for cuba libre which is made in these parts by combining Arehucas rum with Coca Cola and a slice of lemon. Signore Palomba, who hails from Naples where he started to get interested in cocktails after hosting parties as a teenager, has received recognition for his services from those in the know. Such as within the pages of FoodRetail‘s drinks industry bible: Trendrinks. 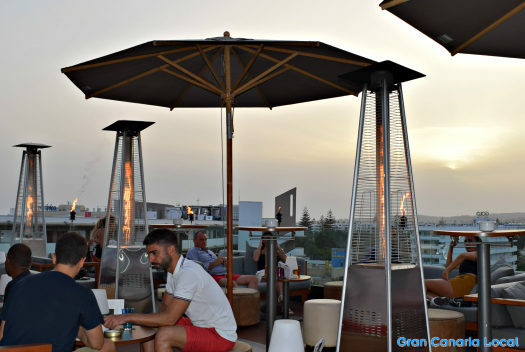 And by way of MTV recommending visitors to “sip on delicious cocktails at Atelier” as one of eight ways to fall in love with Gran Canaria. Atelier Cocktail Bar opens from midday to midnight Sunday to Thursday and until 1:00am Fridays and Saturdays. At busier times, there’s a lift person who prevents the joint becoming too crowded as you listen to sets from electronica’s Swamy DJ, guitar star Walter Silva, and swamp blues from Los Gumbo. Before rounding off the evening with a cigar hand rolled on La Palma by Tabacos Armas‘ Elías Fernández. 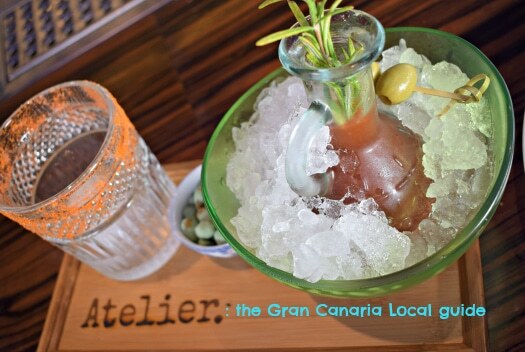 One of Gran Canaria’s best cocktail bars, Atelier boasts a beautiful cocktail menu designed by Beatriz Díaz Caba. Entitled Diary of a Bartender, it replicates Raimondo Palomba’s career which has seen him work his way around the world. Atelier came into the English lexicon via France, meaning a studio or workshop of an artist/artisan, although this diary interprets it as a “window to the world”. We assume the barfly position (the best seats in the house according to Palomba as you can chat to the mixologists and see their sleight-of-hand magic up close) and enjoy watching the boss and one of his most experienced employees, Barbara Monzon, stir (and indeed shake) it up. First stop on our global tour’s Chapter One’s Buenos Aires. And My Mate! (10€), an ingenious take on the caffeine-heavy Argentinian beverage you drink through a silver straw with gin, Green Chartreuse, homemade yerba mate syrup, fresh grapefruit juice, and lime and grapefruit bitter combining in an aperitif cocktail, which in our humble opinion, improves on the original. Our favourite from the all-day section of the cocktail menu is Tokyo’s Asian Mary (10€), Bloody Mary turned Japanese. Comprising rosemary-infused Zubrówka vodka (a celebrated Polish brand already flavoured with bison grass), tomato juice, soy sauce, Worcester sauce, celery bitter, wasabi, lemon, and ginger. It’s a drink we could do having on tap as a hair-of-the-dog hangover cure. We’re also taken by English Breakfast (10€), another all-dayer. 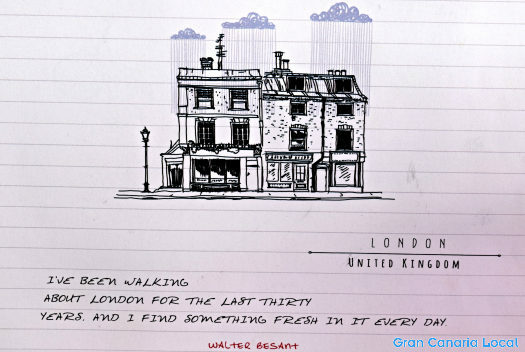 Transported to London, first of all by Díaz Caba’s evocative rainy-day drawing. And then by the “twist on Maestro Calabrese’s classic Breakfast Martini” made up of Hendrick’s Gin (yes, we know it’s Scottish), craft black tea liqueur, Paddington-Bear style marmalade, and orange bitter. 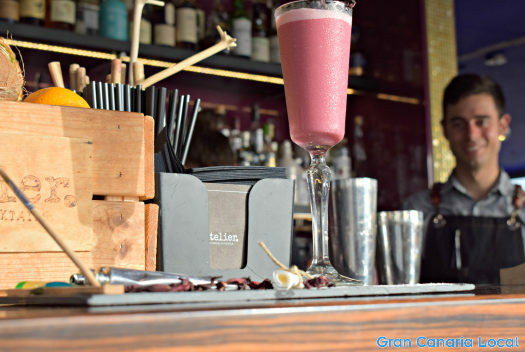 On the digestive-cocktails front, we wouldn’t be Gran Canaria Local without trying Gran Canaria’s Guanche Alexander (11€). Forgive us for being obtuse, but we’ve never heard of the original Alexander. However, we love Atelier’s version which comprises of single-cane Aldea rum, almond milk made on the premises, Mozart white chocolate liqueur, and gofio, the toasted cornmeal which is a base of many dishes on the island including soups and desserts. Chapter Two moves on to spirits including mash-creamy Chopkin Potato Vodka (11€), Canary Islands finest Macaronesian White Gin at 10€, and 12-year-old Yamazaki whisky (24€). 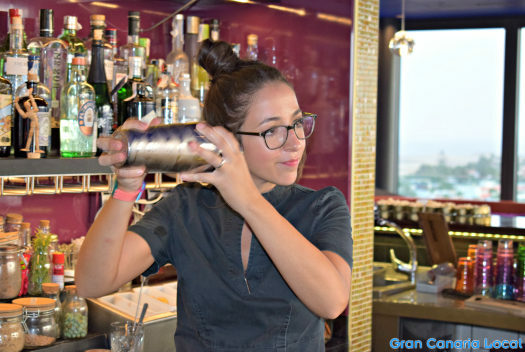 Whilst beer is the focus of Chapter Three with Gran Canaria’s Viva in draught form priced at 3,5€ for 0.3l and 5€ for 0.5l and in bottle form including the malty 0.5l Happyness stout (5€). Elswhere, Chapter 4 contains a small selection of wines, Chapter 5 aperitifs, Chapter 6 digestifs, Chapter 7 non-alcoholic detox coctails, Chapter 8 water and soft drinks, and Chapter 9 teas and coffees. 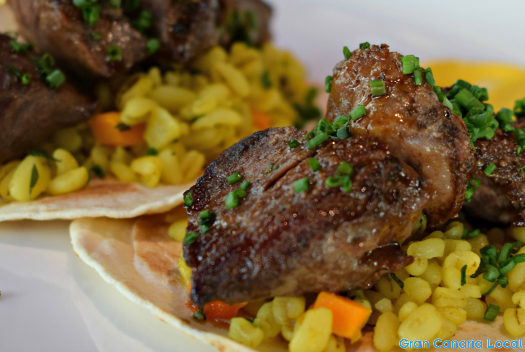 Where DO Mercado by Atelier relies on food pairings with nearby stalls in the Mercado del Puerto, Atelier has its own kitchen. Although Palomba also insists that everything which decorates the various cocktails is edible. And so we rediscover just how chewy a liquorice root is. The “bar snacks” are as playful as the cocktails. And so we gleefully tuck into Soberbia Ibérica (9€). This is a combo of reassuringly hot shoulder of Iberian pork shoulder, chickpea vanilla hummus, and wheat and vegetable stew. As does the colourful trio of alkaline herbs, cherry tomatoes and fried corn citrus vinaigree accompanying veal carpaccio. This Paleta de Vittore retails at 7,5€. It’s another dish which we need to fork into our mush. Disclaimer: In order to write this guide, Barbara, Raimondo, and Atelier kitchen staff prepared a selection of complimentary cocktails and snacks for us to sample. Keeping things cordial at Atelier with My Mate!